The fire department said they expect the number of confirmed fatal victims to grow "exponentially" as the search continues this Monday. The confirmed death toll from a dam collapse in Brazil rose to 60 on Monday, with 292 people still missing, the Minas Gerais state fire department said. 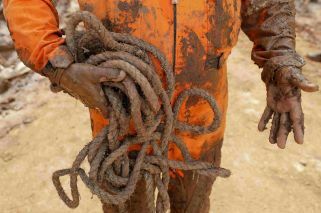 Four days after iron ore waste flooded mine buildings and surrounding neighborhoods of Brumadinho, Brazilian firefighters carefully moved over the treacherous mud, sometimes walking, sometimes crawling, in search of survivors or bodies. Nobody was recovered alive Sunday, a stark difference from the first two days of the disaster, when helicopters were whisking people from the mud. The fire department said they expect the number of confirmed fatal victims to grow "exponentially" as the search continues this Monday. Rescue teams began work on areas where many bodies are expected to be found, like the site of a bus and the Vale cafeteria, early Monday morning. The treacherous reddish-brown mud that surged out from mine dam Friday afternoon has slowed search efforts. The mud is up to 24 feet (8 meters) deep in some places. To avoid the danger of sinking and drowning searchers had to carefully walk around the edges or slowly crawl out onto the muck. On the day of the breach, helicopters looking for bodies were taking off and landing nonstop. On the ground, dozens of rescuers with tracking dogs were searching for bodies through the mountains of mud. The Associated Press witnessed a helicopter rescue of three bodies that arrived at the search center.